On the extraordinary cast-iron extravaganza that is the Pont Alexander III in Paris are a group of padlocks attached to the legs of an ornamental crab. At the time I saw them, I thought they were isolated tokens of eternal love offered by daring tourists – small padlocks inscribed with hearts and the names of the enamoured couples. Only the next day, approaching the Pont de l’Archevêché, just south of Notre Dame, did I realise the full significance of these love padlocks. From a distance, the bridge sparkled and gleamed in the bright sunlight; only closer did I see that its simple lattice railing was covered in a multitude of padlocks, completely obscuring the structure behind. 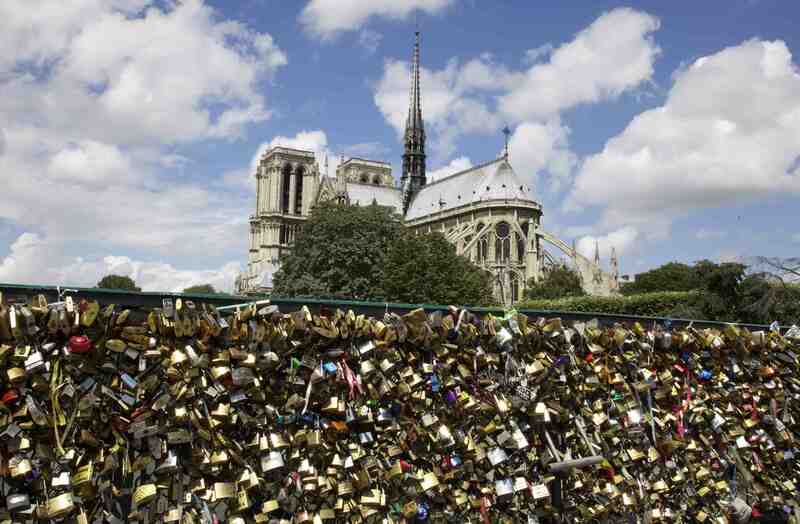 Hundreds, perhaps even thousands, of multi-coloured padlocks hung down in great bouquets of metal, many with coloured ribbons attached, overlooking that great emblem of Parisian romance, the cathedral of Notre Dame. Only a scattering of locks adorned the other side of the bridge, facing an altogether lesser symbolically-charged urban landscape. Only later that day did I discover that these Parisian love padlocks are part of a world-wide phenomenon, with the first appearing in cities in the early 2000s and now adorning a diverse range of urban structures, including Tower Bridge in London, Liverpool’s Albert Dock, the Hohenzollem Bridge in Cologne, the Ponte Milvio in Rome, the Butcher Bride in Ljubljana, and the ‘Mother-in-law’ bridge in Odessa. In all cases, lovers fix their locks to a fence, gate, bridge or similar public monument and, in an action symbolising their everlasting love, throw away the key. 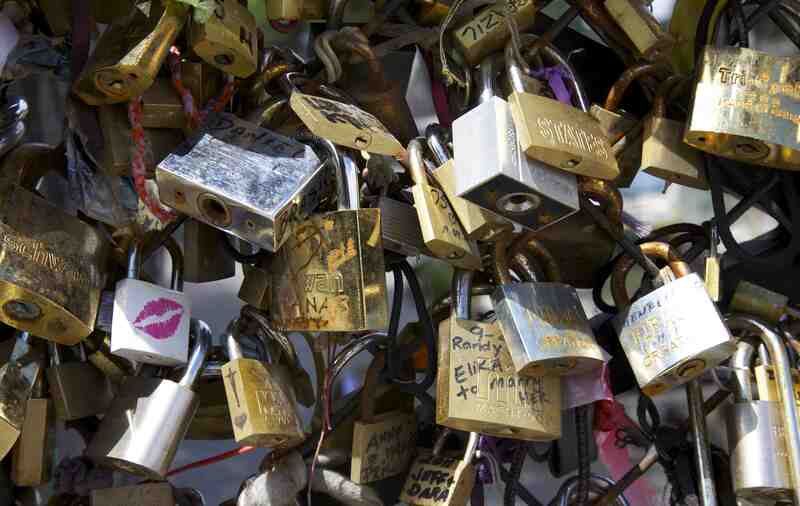 Despite periodic clampdowns by municipal authorities – many of Paris’s padlocks were removed in 2010 – there seems to be an unstoppable momentum behind these tokens of eternal passion. 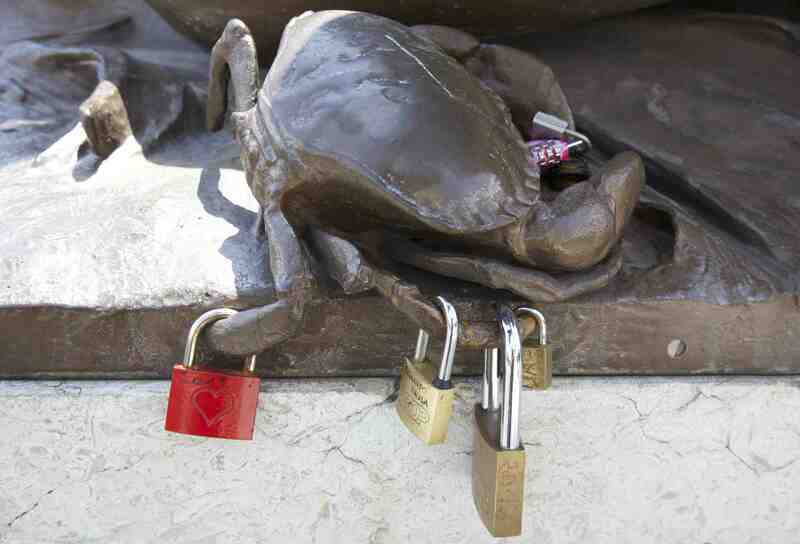 It’s difficult to explain the sheer extent of this phenomenon; according to one source, the affixing of love padlocks in Rome can be attributed to the practice first being depicted in the novel I Want You (2006) by the Italian author Frederico Moccia; while those in Serbia can even be traced back before the Second World War. 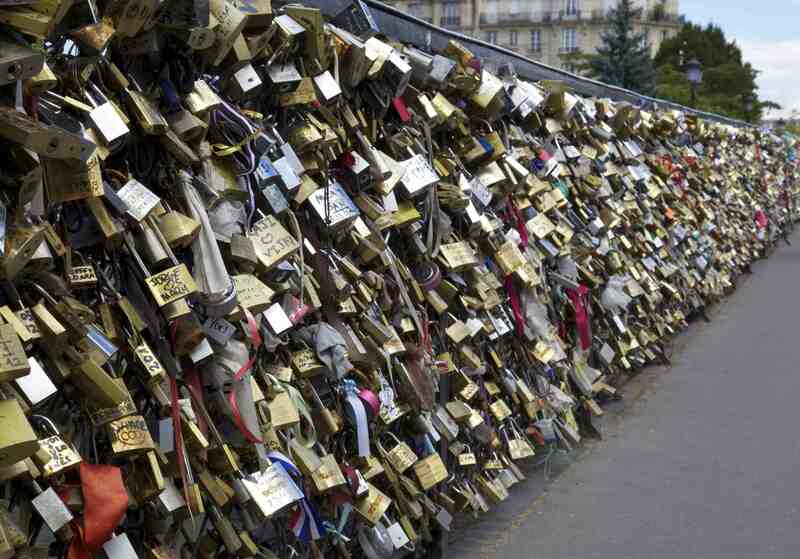 Whatever the explanation, the proliferation of these love padlocks clearly points to a growing need to express, in a concrete, public and collective form, the deepest desires of couples in their individual unions. I would argue that love padlocks create a form of mass urban ornament, at once highly subjective but also cooperative, forming an ornamental whole out of a multitude of basic components. 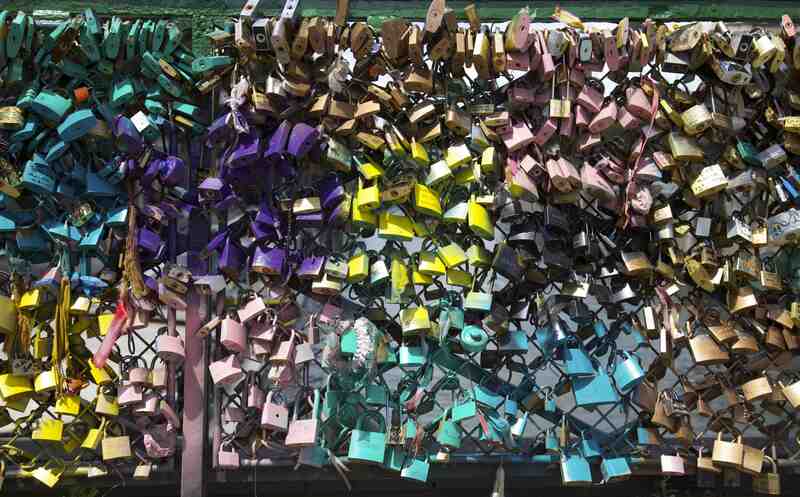 So, on the Pont de l’Archevêché, the seeming chaos of the individual padlocks resolve themselves into a pattern when viewed from a distance; some have even been spray-painted in different colours – presumably by a third party – to create a further sense of aesthetic unity. The notion of these love padlocks as a mass ornament can be related to the work of the German theorist Siegfried Kracauer. Writing about Berlin in the 1920s, Kracauer argued that urban ornament can be seen as evidence of a counter-current to the rationalising and ordering tendencies of the modern metropolis, dominated by planners and other controlling forces. For Kracauer, ornament provides access to a different kind of city, one that gives free reign to the subjective world of the individual – a ‘field where civilisation’s process of repression has met resistance’. In this sense, personalised ornamental expressions in everyday life – making doodles, fashioning hairstyles, even cooking – are important signs of the individual’s contribution to the whole; they represent the ‘will to art’, implying the possibility of new relationships to space and city. I would argue that love padlocks are a significant contemporary instance of this ‘will to art’. They inscribe on the modern city – with its abstract circulations, regulated movements and absence of historical memory – a subjective piece of history, representing both a concrete moment, a subjective memory and a utopian form of time, that is, in the everlasting and the eternal love that has been promised. I first witnessed the phenomenon of love padlocks on bridges in Riga, Latvia a few years back. I have also seen them in Siberian cities like Irkutsk, although it appears to be a recent trend. I have never notcied them in Serbia and so I wil have to look out for that next time I go. Thanks for this. Truly a global phenomenon & one that needs further investigation I think.